1921 REVIEW: HORROR OR COMEDY? The terrible acting leaves you more amused than scared, says Urvi Parikh. It was indeed a task to watch 1921. After three cancelled shows, I fervently hoped that the turmoil of theatre hopping was done with. Little did I know that it was the better part of my day. Because once 1921 began, it had me wondering what I had done to deserve watching Vikram Bhatt's most redundant work ever. 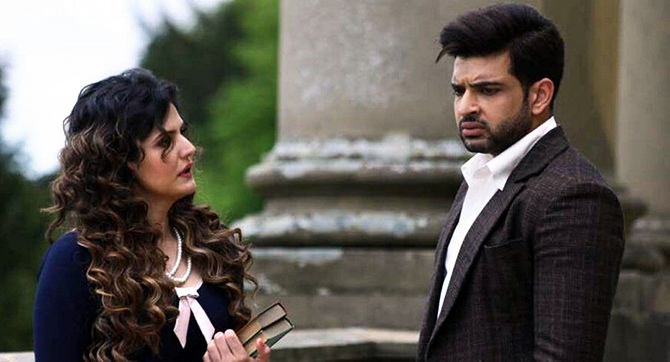 The film centres around Ayush Asthana (Karan Kundra), a gifted musician. Director Bhatt doubles up as Mr Wadia at whose home Ayush delivers his first breathtaking performance. Wadia offers to sponsor Ayush's education at the York College of Music in England, but requests him to take care of his York mansion. The lad takes off to York where soon he encounters a series of eerie things. Wadia's niece has devilish plans to kill Ayush, but his lover Rose (Zareen Khan) is there to protect him. She has the special power to communicate with spirits. An exorcist by hobby, her skills are clearly inadequate. Bhatt uses every trick in the horror book, but his cast don't do justice to what he has in mind. A few scenes are scary and get to you, but the first rule of horror is not to overexpose the ghost to keep the fear alive. In 1921, you seeing so much of the spooks that you stop caring by the time the clock turns to hour two. The terrible acting leaves you more amused than scared.